ReelAbilities is the largest disability film festival in North America dedicated to promoting awareness and appreciation of the lives, stories and artistic expressions of people with different abilities. This spring, Southern is joining venues in New York, Cincinnati, Pittsburgh, Boston, Chicago, Portland, and San Francisco, among others, to feature films selected from over 1000 competitive submissions from an international community and reviewed by the screening committee in New York City, where the festival premieres each year in March. 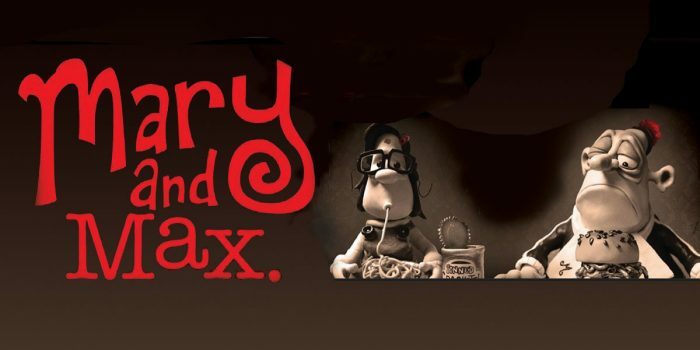 The film, to be screened in the Adanti Student Center Theater on March 19 from 5-7:30 p.m., has some adult content and is not appropriate for young children. A panelist talkback will follow the screening of the film, and light refreshments will be served. Admission is free. The theater is physically accessible and the film is captioned. Initiated in New York in 2007, the ReelAbilities Film Festival presents award-winning films by and about people with disabilities in multiple locations throughout each hosting city. Post-screening discussions and other engaging programs bring together the community to explore, discuss, embrace, and celebrate the diversity of our shared human experience. ReelAbilities events have been held in over a dozen cities in North America and have expanded from the United States to Canada and soon, Latin America. Since its start, ReelAbilities has been consistently receiving an increasing number of outstanding film submissions from across the globe. 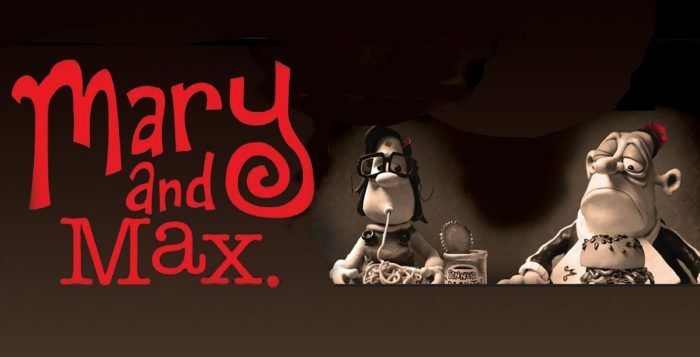 The campus screening is sponsored by Judaic Studies with contributions from Deans’ Offices: Arts & Sciences, Health and Human Services, and Education; and the Department of Communication Disorders. Learn more about this screening. 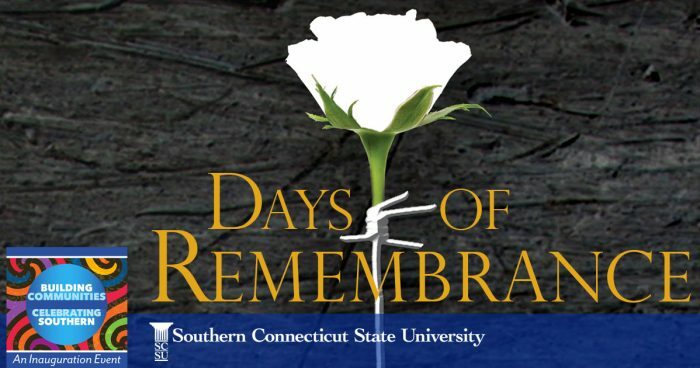 Southern will host three events in honor of Holocaust Remembrance Day, Monday, April 24, 2017. All events are free and open to the public. 1-2 p.m.: Professor Jason Stanley, Ph.D., Jacob Urowsky Professor of Philosophy, Yale University, will share the largely unknown story of his grandmother Ilse Stanley’s heroic efforts to save more than 400 Jewish prisoners from concentration camps between 1936 and 1938, as well as her efforts to help many others escape from Germany. He will read from his grandmother’s 1957 book, The Unforgotten. 7:30-9:30 p.m.: The concert commemorates Holocaust Remembrance Day, and also honors the 100th anniversary of the founding of the New Haven Chapter of the NAACP. Musical selections include Daniel Hall’s hauntingly beautiful piece for choir and viola, “Reflections from Yad Vashem”; Verdi’s “Chorus of the Hebrew Slaves” (Va Pensiero); Leonard Bernstein’s “Somewhere” from West Side Story; American spirituals arranged by Moses Hogan, Sheldon Curry and Thomas Trenney; a musical reflection for trumpet and choir inspired by Martin Luther King’s “I Have a Dream” speech; and Wilhousky’s famous concert arrangement of the “Battle Hymn of the Republic.” – Learn more. All day: The Holocaust Exhibition showcases books, videos, mementos, and pictures from private collections and Hilton C. Buley Library. – Learn more. What’s truly in our way of creating the life we desire? Are you ready to experience the freedom that comes with taking ownership of your life? 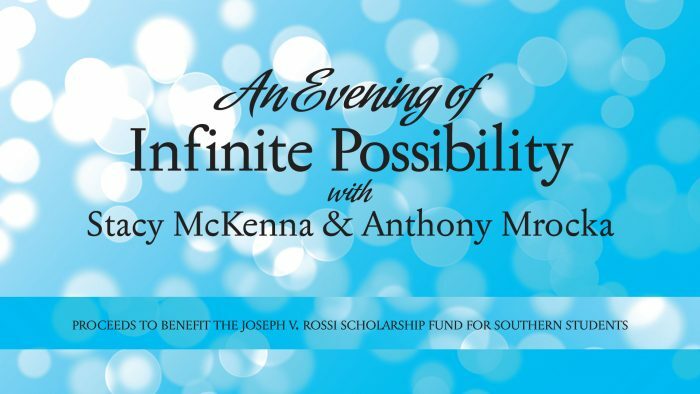 Evolving Soul presents “An Evening with Infinite Possibilities” with Stacy Mckenna and Anthony Mrocka on Tuesday, April 18, 2017 at 6:30 pm. Esteemed Speaker and Executive Coach, Stacy McKenna will open up the evening followed by acclaimed Evidential Medium, Anthony Mrocka, who will talk about healing, bereavement, and connecting with loss. Proceeds will benefit the Joseph V. Rossi Scholarship Fund. The event will be held in Southern Connecticut State University- Engleman Hall Room – C112.